Indonesia’s Mount Merapi volcano erupted repeatedly on Friday, spewing ash and lava, reports say. The plume reportedly rose to a height of about 1,500 meters (~ 5,000 feet). Mount Merapi volcano spewed lava for the first time in its latest round of activity which began Tuesday. Photo: AFP/ Getty Images. Image may be subject to copyright. Mount Merapi, located north of the Yogyakarta, on the densely populated island of Java, is one of Indonesia’s most active volcanoes. Mount Merapi volcano eruption in 2006. Photo: AP. Image may be subject to copyright. Mount Merapi rumbled for many hours before spewing smoke on Tuesday. Photo shows volcano from Balerante, Central Java, Indonesia. 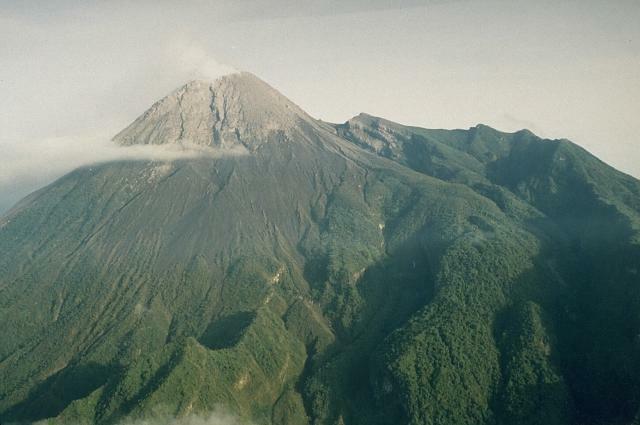 Merapi last erupted in 2006. About 1,400 people have been killed as a result of 3 previous eruptions since 1930. Image Credit: AP. Caption: Fire-Earth. This entry was posted on October 29, 2010 at 12:57 pm	and is filed under Indonesia quake, Indonesia tsunami, Indonesia volcanoes, Mount Merapi volcano. Tagged: Merapi Volcano Observatory, Mount Merapi eruption, Yogyakarta. You can follow any responses to this entry through the RSS 2.0 feed. You can leave a response, or trackback from your own site.